Before beautiful yellow Labrador Obi came to help and support Linda, for 17 years while husband Ricky was at work Monday to Friday, she hadn’t been able to go out on her own in her wheelchair. She’d have to call and ask him to get things from the shops and when he did return he’d have to pick up things she’d dropped. Linda has hypermobility and multiple rheumatological disorders, which make her prone to falls and cause dislocation, strains and sprains of the joints. Linda can hardly believe how her life has changed. “Nowadays I can go out with Obi by my side, confident that he’ll look after me. I can ask Ricky what he thinks we need and go to the shop myself. I’ve even been Christmas shopping on my own for the first time in 17 years which was wonderful,” she says. 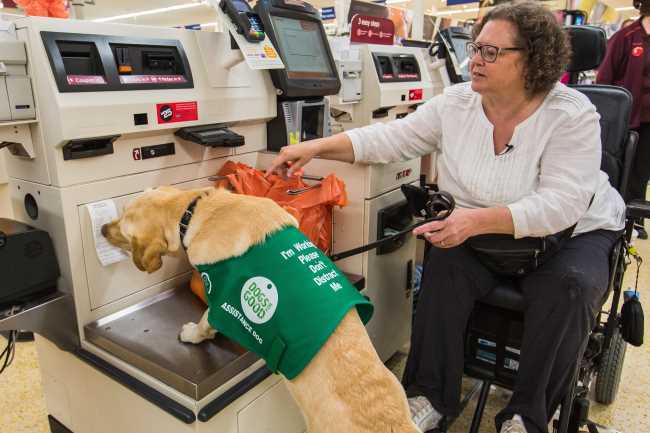 Just as important, assistance dog Obi is a wonderful companion to Linda and gives her a reason to go out. They go out for regular walks, meeting other people with dogs in the park and the woods, hugely contributing to Linda’s well-being. Obi’s presence means a lot to Linda and Ricky, but also to her wider family too. Obi came along on a recent camping holiday and Linda was able to take her five year old grandson to the park alone for the first time. “That was really special and meant so much to me,” says Linda.